On July 1, 1945, Corporal Teruo Usami took off from Miyakonojō East Airfield as a member of the 180th Shinbu Special Attack Squadron and died in a special (suicide) attack off Okinawa at the age of 18. 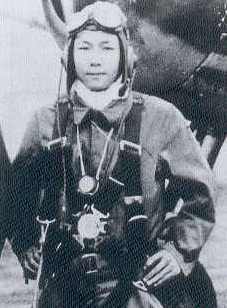 He piloted an Army Hayate Type 4 Fighter (Allied code name of Frank). After his death in a special attack, he received a promotion to Second Lieutenant. He was from Fukushima Prefecture and was a member of the 14th Class of the Army Youth Pilot (Rikugun Shōhi) training program. He wrote the following final letter to his mother. The letter's end has a poem. Since a young age I have caused only troubles for you, but a sense of satisfaction runs through me to be a man who now has received such a sortie order. The time finally has come to serve as a fighter pilot. I certainly will do my best to achieve honor for the family as I also have written before. Kind Mother, the best in Japan, if I could tell fortunes today with playing cards, yours would be the best. You will be able to spend your happiest days in the future. Father also will have long days. It seems he will be able to return home and live together with you. My fortune says that I certainly will live to be more than 35 years old, but I will go as a foundation of peace for the Empire thanks to the Emperor. I do not want to carry out a sinking with the photographs of you and Father, so now I am enclosing them here to return to you. With the pleasant photograph of you who tenderly watched me each day in my activities and flying, today when I think of my departure, I truly feel lonely. Even with the photographs and departure, I will be strong to defend Japan with an unflinching spirit. Seeming short, it was a long 19 years . Forgetting all the good and bad, I only strive to find a ship and surely sink it. The announcement will probably be at the time of the Bon Festival . This year's Bon Festival will be my first one. When I gaze at the mountains, I am reminded of the scenery in Fukushima. Best mother in Japan, please always be healthy. I am not writing anything in particular to Father, since I am thinking that he cannot be contacted in Mongolia. I will go in high spirits. The letter and biographical information on this page come from Chiran Tokkō Irei Kenshō Kai (2005, 151, 161) and Osuo (2005, 206). Corporal Teruo Usami and Corporal Sukeo Nitta were the only two members of the 180th Shinbu Special Attack Squadron to make a sortie and die in a special attack on July 1, 1945. Corporal Sukeo Nitta wrote a last letter to his parents and older sister than mention Teruo Usami in it. 1. The traditional Japanese method of counting age, as in much of East Asia, regards a child as age one at birth and adds an additional year on each New Year's day thereafter. This may explain why the letter indicates his age as 19 whereas the background information in Chiran Tokkō Irei Kenshō Kai (2005, 151) indicates his age as 18. 2. The Bon Festival is an annual Buddhist event celebrated in mid-August to honor the spirits of one's ancestors. During the Bon Festival, it is believed that the spirits return to visit their living relatives.